Thyroid patients must contain following 3 things in their regular diet. 2. Boiled Vegetables – In this mainly eat boiled potatoes, sweet potatoes, cluster beans, drumsticks like food. This will add up good nutrition for patients. 3. In main meal regularly eat brown rice with different types of dals. Other requirements in diet are..
Vitamin B – Get it through 1 or 2 glass of milk or 1 or 2 cup of curd which is high in protein, vitamin B & selenium. Vitamin D – Add mushrooms in diet. Dry fruits – Mainly walnuts – helps to decrease stress level.. and tension. Add oat meal to diet for breakfast. Regular detoxification add either ginger water / green tea or wheat grass juice in morning. & can have juice of grapes, oranges , pineapple and carrots twice a day. These much is enough to take care of thyroid.. Cure it in natural way. Patient will improve their mental health through this diet so improvement can be seen faster. On demand of Rekha Sahay – here is all about thyroid diet…. Hope it will help you & also others. Thyroid Diet – Don’t s.
As I am posting thyroid series… here I am with natural cure of thyroid especially hypothyroidism along with weight loss. I will give you information about what you should eat & what you must avoid to cure your thyroid naturally. Sugar – Sugar has zero nutrition value. It slows down your metabolism which results in weight gain. Gluten – Gluten is the ingredient which is used in the making of pav, bread, pizza base, burgers i.e. products made up of all purpose flour (maida). Avoid these products in diet because it reduces effectiveness of medicines & causes lack of essential nutrients in the body. Soya products – Thyroid patients should avoid soyabean oil, soyabean milk,paneer and soyabean as pulse in their diet. Also avoid chinise food with high amount of soya sauce. Cruciferous vegetables – Patients with iodine deficiency must avoid vegetables like Cabbage, Cauliflower, Broccoli because they contain high Goitrogens which reduces iodine in body. Junk food should be avoided. In that fried food, processed / packed food , fatty foods i.e. made up of all purpose flour – pizza, burger, cakes, pastas, noodles, etc. Thyroiditis is a term indicating presence of thyroid inflammation. Postpartum thyroiditis – painless lymphocytic thyroiditis occurs in upto 10% of women, postpartum. Riedel’s thyroiditis – rare , occurs primarily in middle aged women. Hashimoto’s thyroiditis – An autoimmune disorder which typically affects middle-aged & elderly women. Feel free to ask if you don’t understand medical terms. Thyroid Diseases in brief…. part 2. Hi friends, I have acknowledge you all about Hyperthyroidism in my last post… Now in this I am going to share about Hypothyroidism. Hypothyroidism is a clinical condition results from reduced production of thyroid hormone. When Hypothyroidism is of severe stage & long standing, it is seen as myxoedema which is characterised by deposition of hyaluronic acid and mucopolysaccharides causing swelling of skin and of subcutaneous tissues. 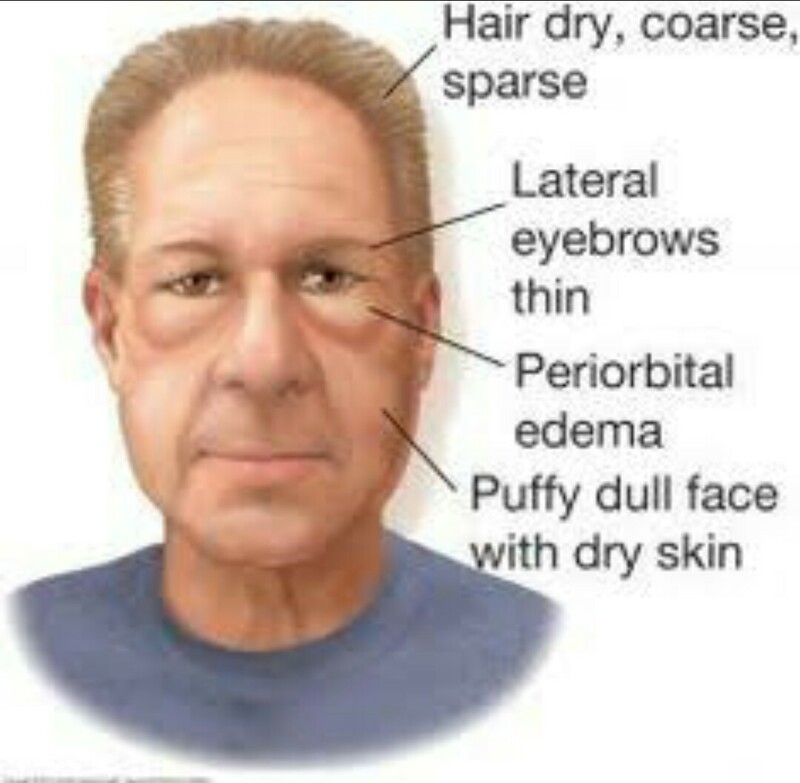 Face in picture represents Myxoedema. Skin & subcutaneous tissues – dry skin , puffiness of face , baggy eyelids, Myxoedema – swollen oedematous appearance of neck, back of hands & feet , minimal sweating, alopecia, vitiligo. reduced T4 , rise in serum TSH indicates primary hypothyroidism. Reduced T4, With normal or below level of serum TSH suggests secondary hypothyroidism. Serum cholesterol – Elevated in primary thyroid failure. Replacement therapy : Thyroxine (T4). Syptomatic improvement is seen within 2- 3 weeks of starting treatment. Monitoring therapy : Restoration of T4 and TSH to normal level. Hope you get some knowledge through this post.. Feel free to ask if you don’t understand medical terms…. Thyroid Diseases in brief…. part 1. Hyperthyroidism is the syndrome resulting from excess of thyroid hormones. 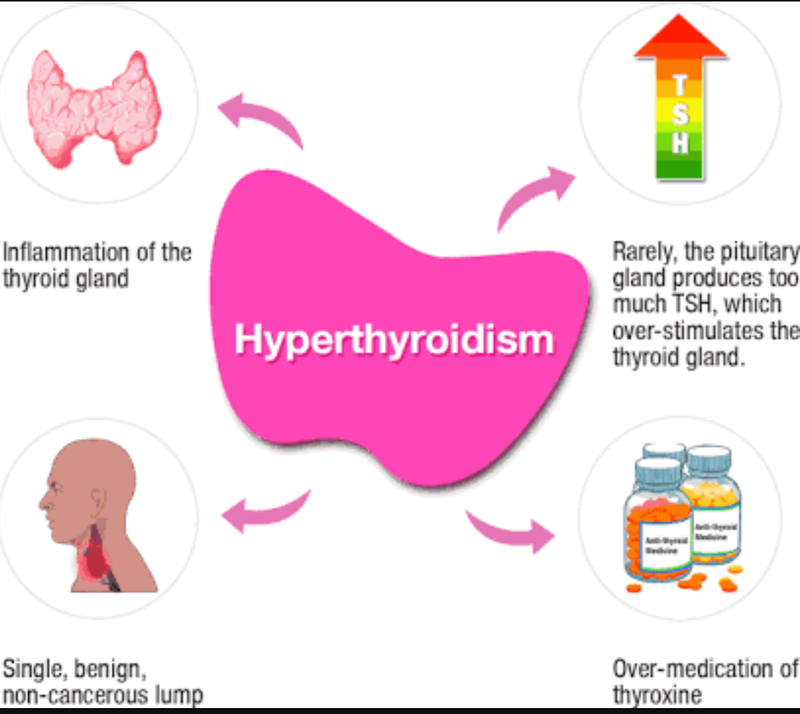 The term Hyperthyroidism indicates thyroid gland overactivity resulting in thyrotoxicosis, but thyrotoxicosis can occur without hyperthyroidism when stored hormone is released from a damaged thyroid or when excess thyroid hormone is taken. 1. Grave’s disease – Autoimmune disorder in which thyroid stimulating immunoglobulin (TSI) binds to & stimulate thyroid stimulating hormone (TSH) receptor on thyroid cell membrane resulting in excessive synthesis and secretion of thyroid hormone.